NWSRG – one of our best kept secrets? The work of the UK’s National Winter Service Research Group (NWSRG) is one of the highways winter maintenance industry’s best kept secrets. This is a comment I made at this year’s Cold Comfort, the annual showcase exhibition and conference for winter maintenance professionals. Now, as one of the newly-voted industry members to the NWSRG Steering Group, I am determined that the work of this group should be communicated far and wide. The NWSRG’s founding principles are built on conducting research, developing guidance for central and local government and delivering continuous improvement in winter maintenance operating practices on all roads in the UK. Originally formed by local authority highway practitioners working with our national agencies for England, Scotland, Wales and Northern Ireland, membership was limited to those who subscribed to the group. Working with leading commercial organisations in the sector, research was undertaken in order to advance developing guidance in winter maintenance operations. One of the initial pieces of research conducted by the group investigated whether more science could be used to determine appropriate spread rates rather than using the traditional 10gm/m2 or 20gm/m2 rates. This led to the development of the key factors determining application rates, which in addition to those already known – presence of moisture and surface temperature of the road – include wind speed, moisture content of salt, calibration of gritters and type of treatment used. Research into this area continues, with Transport Scotland most recently leading trials into the application of brine as a potentially more efficient application method. Those initial research findings formed part of the NWSRG Practical Guide for Winter Service, published over a decade ago, providing members with a qualitative and quantified research basis to deliver more efficient and economical approaches to winter service. 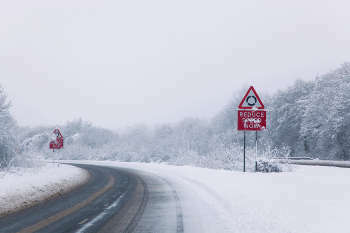 In 2010, after some of the coldest and most extensive winter weather for 30 years, then transport secretary Philip Hammond called upon the UK Roads Liaison Group and the NWSRG ‘to prepare additional straightforward guidance on spread rates based on all evidence available, so that all highway authorities can adopt the practice of the best’. In recognition of the value of the NWSRG, its steering group became formally recognised as part of the UK Roads Board and in responding to the call to action, it set about developing and integrating guidance to the national code of practice. Chris Cranston of Devon County Council is the newly-elected chair of NWSRG and while he says the guidance has provided a step change improvement to winter service, he admits that ‘the outcome became unwieldy compared to the rest of the Code of Practice, with an Appendix [H] of over 170 pages, which was challenging to digest and not easy to practically implement’. Some constructive criticism from practitioners was also provided and consequently, a period of reassessment ensued. One of the principal outcomes from the collaborative approach to reassessment is the determination to present guidance in a concise, easy to understand manner without losing valuable, research-based detail, which is beneficial for those practitioners wishing to adopt a more advanced approach to operations. Vice chair Carol Valentine of Kent County Council, is also part of the newly-formed leadership team and is particularly passionate about the need for delivering detail in a straightforward manner. Of course, over simplification has its own pitfalls, something that Mr Cranston is careful to guard against. He says: ‘As soon as you start to try and simplify matters, you are making decisions about which facts to remove. This is not our intention. For example, if we start banding spread rates according to temperature, the guidance suggests almost double the application spread rate between -1.9°C and -2.1°C. Science tells us that there is a linear relationship, so moving between these temperature bands results in the need for only an incremental change in salt application. Producing the latest, easily digestible guidance, is no small undertaking and although it is now officially incorporated into the UK Roads Board, the subject of securing a sustainable means of funding to support NWSRG initiatives is still under negotiation. The guidance continues to be developed by practitioners alongside their daily work, supported by limited funding from national agencies and membership subscription. Embedding practitioners at the heart of developing guidance is beneficial. There is recognition however, that the development of such guidance cannot be accomplished alone. The continuation of the freely-given support of industry experts, grounded in national experience, is crucial in driving such innovation. More recent alliances being formed with the Institute of Highway Engineers (IHE) and the public service research arm of UK Met Office will additionally shore up capabilities to developing guidance to support a risk-based approach to decision-making in as timely a manner as possible. Time is of the essence, with a little over one year to go before the transition deadline to implement the latest Well-Managed Highway Infrastructure code of practice, it is crucial to publish the supporting Practical Guide. Members of the NWSRG will receive the published chapters first and have already had the opportunity to provide feedback as the guidance is developed. As regards membership, at its roots, NWSRG relied upon the financial subscription of members to fund research. In return, those members benefited exclusively from advanced research-based thinking in winter service practice. In becoming a valuable and recognised part of UK Roads Board with a remit for developing national best practice, the guidance will ultimately be published to benefit all. In the longer-term it is possible that there could be some government funding for groups such as the NWSRG, but in the short-term it is very much dependent on financial support through membership. The NWSRG is committed to ensuring that being a member maintains some significant benefits. The benefits of membership include the opportunity to guide its future focus, determine the direction of research and articulate the issues of greatest concern, as well as getting an early sight of any guidance produced. The IHE is willing to offer reductions to NWSRG members in their winter training, and membership should also support authority’s self-assessments. In the short-term, Mr Cranston is keen to get back to the core purpose of research to develop better ways of working. The quandary of understanding residual salt remains at the top of the agenda. However, our world is undergoing digital transformation and this group has an opportunity to shape thinking as to how advanced technology may be effectively applied to severe weather management to improve in-vehicle communication of hazardous conditions and ultimately to enable safe operation of autonomous vehicles whatever the weather. Cold Comfort 2018, the 27th Annual Winter Maintenance Conference and Exhibition takes place at the Ricoh Arena, Coventry on 16 and 17 May 2018. Register your interest today at https://coldcomfort.tn-events.co.uk and we will keep you informed with the Early Bird Discount offers and programme updates. This article first appeared in the August/September issue of Highways magazine.